Thank you very much indeed for your recent extremely generous donation of food from pupils, parents, friends and staff, at Harvest Time. We are extremely grateful to you all for this amazing donation, which will help us tremendously in our ongoing work to support those in need in the Nuneaton Area. I am sure that you will be interested to learn that during September we have provided 3 days of food for 353 people, which has included 146 children. 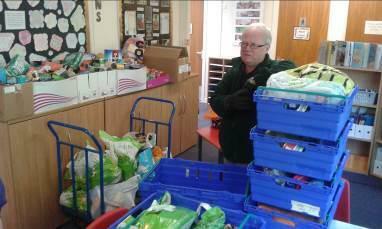 We greatly appreciated the help from the team of very polite pupils in loading your amazing donations. Thank you all again for your wonderful help and support. who has been working very hard over the Harvest period with his team of volunteers.